On this site you will find more about the band and we hope you will be inspired to come along to one of our forthcoming events or even become a member! Thank you again for your visit and we look forward to meeting you. 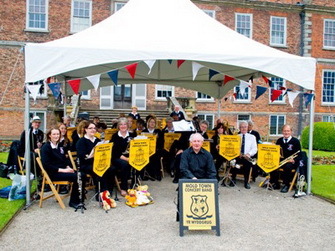 Mold Town Concert Band would like to welcome you to our website and thank you for taking an interest in us. We are based in the busy market-town of Mold, Flintshire in beautiful North Wales. We’re also on Facebook - click to have a look! The band are extremely proud to lead the annual Remembrance Day parade in Mold town centre and we were, of course, in attendance for last year’s event on Sunday 11th November 2018. The parade was covered by The Leader newspaper and an article containing photographs and a short video can be found by clicking on the poppy. All of the band’s confirmed dates for the next few months are on the website’s Events Page. MTCB were invited to play at Raytheon UK as part of the RAF centenary celebrations. A team of runners is carrying a commemorative baton to 100 places associated with the RAF in 100 days. Pictures are in our Galleries.